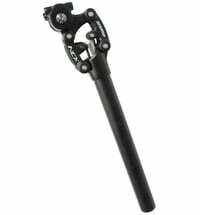 SUNTOUR Seatpost SP12 NCX with 350mm length. Suntour is a Japanese company, based in Osaka, that manufactures bicycle components. It began in 1912 as Maeda Iron Works Company to produce drive and shifting components. Up to the first bankruptcy in 1994 Suntour Maeda was one of the leading companies for bicycle components. 1964-1984 Suntour held the patent on the slant-parallelogram rear derailleur. With that the introduction of the indexed shifting was possible. In 1989 the company went by new but consuming developments, the price pressure and the incompatibility with Shimano into bankruptcy. The brand was bought by Mori Industries and renamed to SR SunTour. After that, the brand experienced a brief revival with the development of Microdrive drive and the S -1 shifting device. However, further falling market share could not prevent a further retreat from the original equipment for shifting and drive components. Today SR Suntour is a manufacturer of suspension forks that also produces derailleurs, disc brakes and shifting levers. The company SR Suntour holds, however, only the naming rights of the once successful series components, so some of the newly launched components only carry the name. So there is no development continuity.